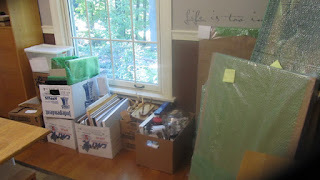 Peggi Habets Studio: We're Moving! You haven't heard a peep out of me recently, for good reason. I'm buried in boxes! For the past month we've been painting, spackling, packing, looking for things we just packed, moving, storing, and reassessing our belongings. Nothing makes you realize you've been hanging on to stuff for way too long like moving. After 23 years of raising kids in the suburbs, we will be moving to a smaller place in the city, closer to downtown Pittsburgh, the stadiums, and plenty of art galleries. I will be back in touch very soon.